While it’s been pretty chilly this week alongside the Peconic Bay, this is a great time of year to daydream about a summer full of boating. 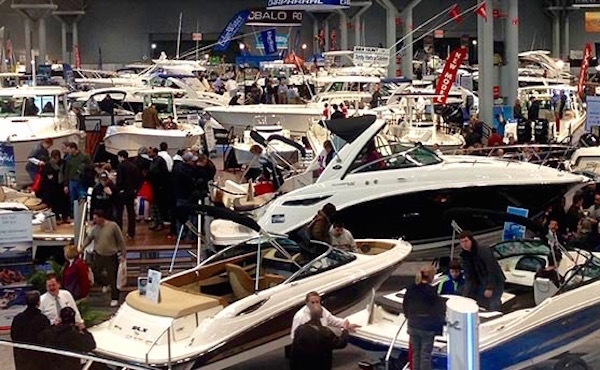 The 111th annual New York Boat Show begins tomorrow, Jan. 6, and continues through the weekend at the Javits Center at 655 West 34th Street in Manhattan. We’ll be reporting live from the boat show Friday on our Instagram, Facebook and Twitter pages, and will be bringing you information on the latest boating information from the show here on this website throughout the weekend. The show, which is sponsored by Progressive Insurance, highlights all kinds of boats — from kayaks to sailboats, sport fishing boats and power yachts. This year’s ‘Queen of the Show’ is the Sea Ray 510 Sundancer, a 50-foot yacht that has features ranging from a new, open-format Skyflow design to a climate-controlled cockpit sunroom to a Zeus Propulsion system that includes a helm joystick, Skyhook Station Keeper and an integrated autopilot. Chances are, we will not be the lucky ones bringing the Queen of the Show back to the Peconic Bay. But we will get a chance to see what she’s all about. The show will also include demonstrations and hands-on practice with everything from tying up to a dock to navigation to learning how to repair your boat at Fred’s Shed’s Interactive DIY Learning Center. It will also feature several “Ask A Captain” segments with experienced mariners. The full schedule of events is online here. The United States Power Squadron will also be on-hand with their Boating Skills Virtual Trainer, which you use to “drive” a 20-foot console boat on a lake with other powerboats, sailboats, navigation aids and a marina. This year’s boat show comes at a time when the marina industry is rapidly recovering from the great recession. Sales of large motor boats, especially for offshore fishing, were up 9.4 percent over the previous year in the first half of 2015, and the National Marine Manufacturers Association is predicting an 8 percent increase in new powerboat sales and expecting a return to pre-recession boat sale levels in 2016. Tickets to the show are $16 for adults and children 15 years of age and younger get in free. The show will be open from noon to 9 p.m. Wednesday through Friday, from 10 a.m. to 9 p.m. on Saturday and from 10 a.m. to 5 p.m. on Sunday. More information is online here.